60g Best price Nannochloropsis Gaditana. 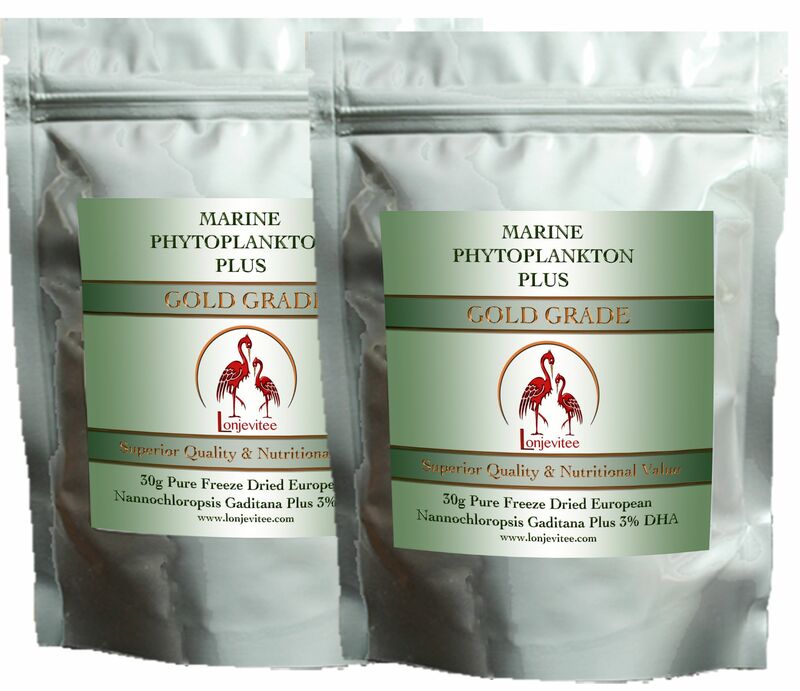 European Marine Phytoplankton PLUS with added DHA Omega 3 from fish oil. This is a raw green superfood packed with Amino Acids, Minerals, Vitamins and Carbohydrates and NO FLLERS OR NASTY ADDITIVES. Freeze Dried. Not suitable for Vegetarians or Vegans. Currently unavailable. Loose powder still on sale. Ingredients: Pure Freeze Dried Nannochloropsis Gaditana (Marine Phytoplankton), PLUS 3% DHA from Fish Oils. This whole green superfood is rich in Amino acids, Vitamins, Minerals and Omega oils. The most significant component is the Omega 3 known as EPA which is not found in Spirulina or Chlorella. EPA is important for Brain health. It is converted to DHA inside our body. See the back label image for a list of the main components found in our Phytoplankton. AQUIFER WATER IS BETTER THAN SEA WATER. Our Phytoplankton is grown in open tanks using water pumped from 80 metres below the ground. The water contains minerals dissolved during its percolation down through layers of rock. This aquifer water, sometimes known as ‘ancient sea water’, is purified naturally and contains no sewage, petrochemical or radioactive waste contaminants that can be found in today's ocean's. Also, there are no pesticides, herbicides or other chemicals used at any time during growth. FREEZE DRIED IS BETTER THAN SPRAY DRIED. And if you choose a spray dried product there are traces of chemicals from the drying tanks mixed in. We don’t sell spray dried because so much goodness is lost in drying due to the temperature used, and the finished product is not as soluble in water. The only disadvantage of freeze drying is that it cost more to produce, but it’s worth it for the superior quality. Millions of microscopic plants that are packed with minerals, amino acids, vitamins and much more. Revitalise, and cleanse your whole body with this wonder of nature. For your general health, well being and longevity. Used in combination with L-Carnosine it can help maintain good health.